The health effects of smoking are well known. But there are all kinds of benefits to kicking the habit. You'll live longer: Your lungs will immediately work better. Within a year of quitting, your risk of heart attack declines by 50 percent. Within 10 years, your risk of lung cancer will be about the same as if you'd never smoked at all. 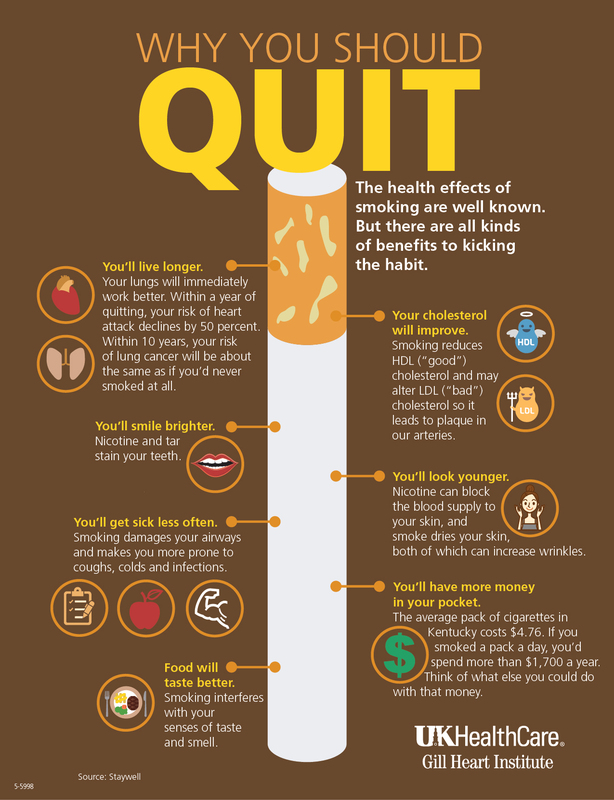 Your cholesterol will improve: Smoking reduces HDL ("good") cholesterol and may alter LDL ("bad") cholesterol so it leads to plaque in your the arteries. You'll smile brighter: Nicotine and tar stain your teeth. You'll look younger: Nicotine can block the blood supply to your skin, and smoke dries your skin, both of which can increase wrinkles. You'll get sick less often: Smoking damages your airways and makes you more prone to coughs, colds and infections. You will save money: The average pack of cigarettes in Kentucky costs $4.76. If you smoked a pack a day, you'd spend more than $1,700 a year. Think of what else you could do with that money. Food will taste better: Smoking interferes with your sense of taste and smell.